There are some things about childhood that your kid "misses out" on if they're gluten free. We never felt that we were depriving Babs of anything and never felt the need to make substitutions for the gluten items we cut out of our diet. When her school is doing a Dr. Seuss week with a 1 Fish 2 Fish activity, what do you do? Luckily, Babs' teacher is out of this world amazing and makes sure as much as she can that Babs is never singled out or left out. Unfortunately there are no commercially produced fish-shaped snacks. (Except Swedish fish, or as I like to call them, fish-shaped high-fructose-corn syrup.) 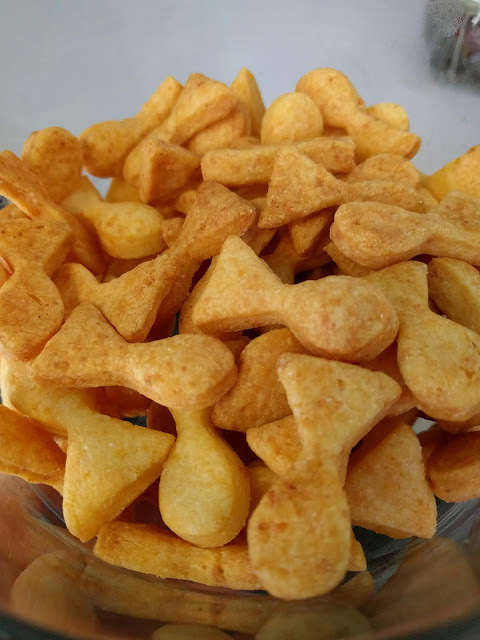 So I scoured the internet, made a few test batches and perfected this Gluten Free Goldfish Cracker recipe. Makes about 4 cups of goldfish. Combine all ingredients except milk in a food processor. Pulse until it resembles little crumbles. Add milk and pulse some more to combine the dough. If too crumbly, add a little more milk. If too thin, add a bit more cornstarch. Dust your work surface with cornstarch or flour. Lay a sheet of parchment paper over the dough. Roll out dough to 1/8-1/4" thickness. Cut out your desired shapes and place on parchment-paper-lined cookie sheet. They can be quite close together; these puff up nicely and won't spread. Cook in preheated convection oven at 400 F for 10 minutes. If you don't have a convection oven, you may need to add cook time. They'll burn quick, so pay attention. If they're a touch underdone, they'll still be delicious, but an extra minute is all it takes to get that golden orange color and the perfect crunch. 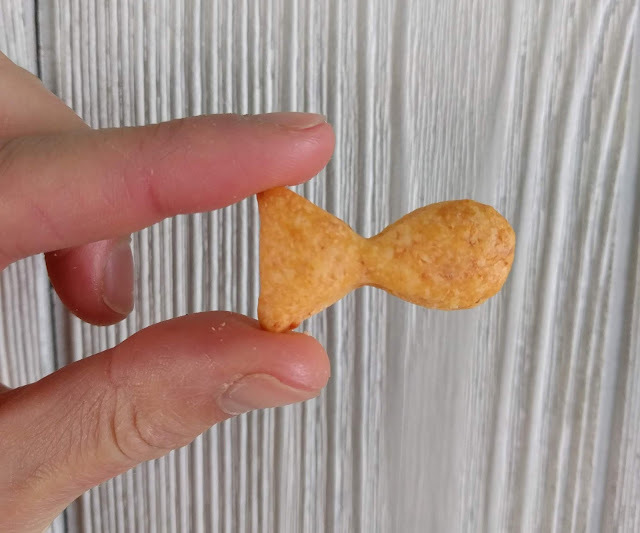 Goldfish and Cheez Its are essentially the same thing, so if you don't require the fish shape, just cut them in squares and be done with it. 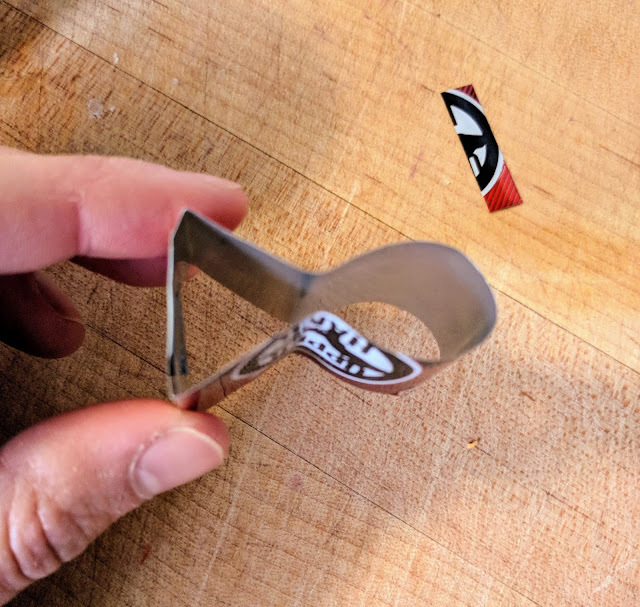 But to go the extra mile, you can DIY your own mini goldfish cookie cutter from an aluminum can. It's not as hard as you think it's going to be. 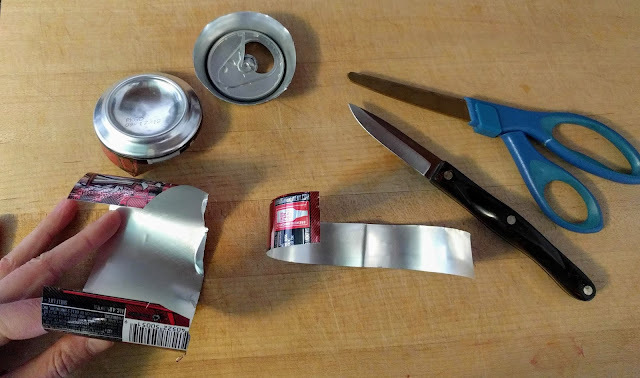 Using the knife, poke a hole big enough to get your scissors in, then use the scissors to cut the circumference of the can. 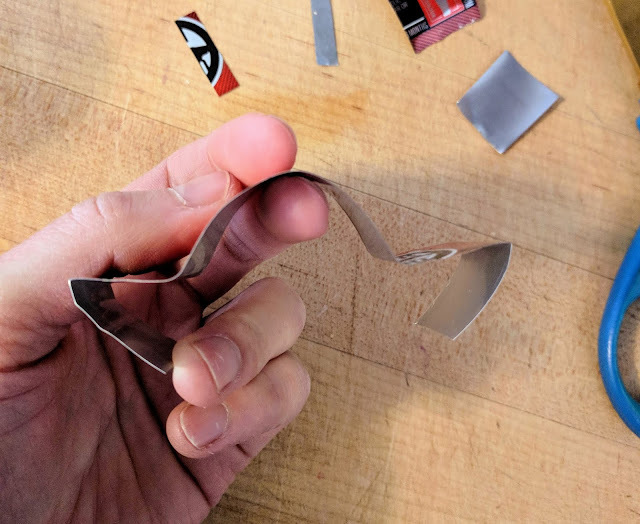 Cut a vertical slit, then cut about a 1" strip. Gently bend the strip into your desired shape. I started with the center front of the curved fish head, then bent the strip outward. Then bend each side of the strip back in for each point of the tail. Trim off the excess. Overlap the ends and secure using duct tape. Using small strips of duct tape, wrap the cookie cutter edges on the upper edge (the edges you will be pressing down on) ONLY. Once upon a time, there lived a lovely girl named Cinderella. Sadly, her father passed away, leaving Cinderella with her stepmother and two stepsisters. They were very cruel to her and treated her terribly, making her work cooking and cleaning all day long. But Cinderella was cheerful nonetheless, and she was friends with the house mice and sang with the birds outside her window. One day, the Prince of the kingdom decided he would host a ball at the palace, in order to choose a bride. Invitations were sent to every available lady in the kingdom. One invitation came to Cinderella's house. Cinderella thought this meant she, too, would be able to go to the ball. How wonderful that would be! To escape the dull drudgery of her life for just one night! She had a gown of her mother's that she would fix up with her needle and thread. It would be nothing fancy, but she certainly couldn't go to a ball in her old raggedy dress she wore around the house. But her stepmother and stepsisters scorned her. "Of course you can go," her stepmother said. "If you finish all your chores." So all day long, her cruel stepsisters made extra work for Cinderella. Whenever she finished cleaning up something, they'd make it messy again, so she didn't have any time to fix up her mother's dress she wanted to wear to the ball. At the end of the long day, Cinderella sighed. "Oh well, I guess there will be no ball for me." But, her mouse and bird friends had spent all afternoon working, too. They saw what Cinderella's stepmother was doing to her and they wanted to help. So, using the sketch Cinderella had made of what she wanted the dress to look like, they cut and stitched and strung pearls and ribbons and fixed up her dress for her! Cinderella was so excited when she saw what they had done. "Thank you so much my friends!" she exclaimed, hugging them all. She quickly dressed and hurried downstairs, where her stepmother and stepsisters were about to get into their carriage to go to the ball. Even though her gown was not as fancy as her stepsisters', she still looked beautiful. Her stepmother wanted one of her own daughters to become Queen, so she didn't want Cinderella to go to the ball and catch the Prince's attention. She accused Cinderella of stealing the pearl necklace she was wearing. Her stepsister snatched it off her neck and tore her dress too. They pulled at the ribbons and beads until her dress was in tatters. Then they got into the carriage and rode away, leaving Cinderella there alone. Defeated, sad and lonely, Cinderella rushed outside into the garden and sat on the ground, crying onto the stone bench. Suddenly, she realized she was not alone anymore. A kindly old woman was sitting on the bench, patting her arm. "There, there, dear. It'll all be alright," she said. "Who are you?" Cinderella exclaimed. "I'm your fairy Godmother of course! I'm here to help you." Her fairy Godmother knew Cinderella wanted to go to the ball, so she used her magic. With a wave of her wand and a Bippity Boppity Boo, she transformed a pumpkin from the garden into a carriage, two mice into horses to pull the carriage and a rabbit into a coachman to drive it! Then she turned to Cinderella. She waved her wand and Cinderella was suddenly dressed in a beautiful sparkly blue gown. "Remember dear, the magic will only last until midnight!" her fairy Godmother told Cinderella. At the palace, Cinderella marveled at the beauty of the ballroom and the luxury of the other ladies. She was having such a lovely time just looking at everything. The Prince was swamped by all the ladies wanting his attention, but he noticed Cinderella wandering out by the balcony. He left all the other ladies and went to talk to her. Cinderella was very surprised, but she accepted when he asked her to dance. The Prince didn't leave her side all night. They talked and laughed and danced. Cinderella was having such a lovely evening, she lost all track of the time. Finally, she got a look at the clocktower. It was five minutes to midnight! "I have to go!" she exclaimed and rushed out. The Prince chased after her. "Wait! I don't even know your name!" On the steps, she lost one of her glass slippers, but she couldn't go back for it. She didn't want the Prince to see her when the magic spell wore off. She got home just in time. The carriage changed back into a pumpkin. The horses turned back into mice, the coachman back into a bunny and Cinderella was dressed in her ragged old dress again. The only thing she had left from her magical evening was one sparkling glass shoe. But, oh, what an amazing night! The memories would be enough to help her endure her stepfamily's cruelty for as long as she had to. But the Prince did not give up so easily. The next day, he sent his Governor to every home in the kingdom, carrying with him the glass slipper, the only clue the Prince had about the mystery lady he wanted to marry. Every lady who'd attended the ball tried it on. When the Governor came to Cinderella's house, her stepmother locked her in the attic so she couldn't try on the glass slipper. As her stepsisters tried to cram their big feet into the dainty glass shoe, Cinderella's mouse friends went on a dangerous mission. They snuck past the house cat and stole the key from her stepmother's room. They unlocked her door and Cinderella rushed downstairs just as the Governor was leaving. "Wait, please! I'd like to try." Before she could try on the shoe, her stepmother tripped the Governor and the glass slipper shattered on the ground. He was devastated! "Don't worry, sir," Cinderella said kindly. "I have the other shoe." And so she did. She retrieved the other glass slipper from her bedroom and put it on. It fit her foot perfectly, because it was made for her. The Governor knew this was the woman the Prince was looking for, so he whisked her off to the palace. As soon as the Prince saw her again, even in her ragged old dress, he knew she was the woman he'd fallen in love with. He asked her to marry him right there, and she said yes. 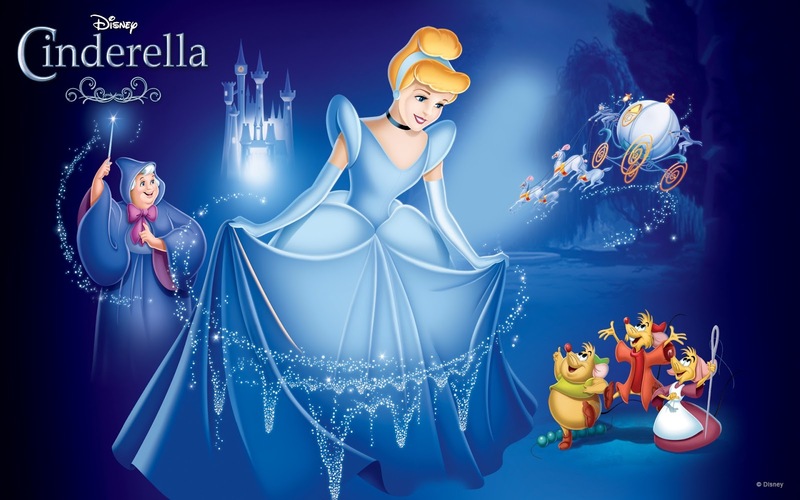 Cinderella became Princess of the kingdom and eventually Queen. She brought her mouse friends to live at the palace with her, and they all lived happily ever after. The End. Lightweight, easy to carry in a backpack and doubled as a sweater on windy days. November through January in Southern Spain can get nippy, especially at elevation. But you don't want to carry a bulky jacket or big sweater. Layering is key. A mid-weight sweater and a rain jacket to block the wind was the perfect combo. The stylish jackets you see the Go adults sporting are the Marmot Precip . For the times when your Airbnb is a little stingy with the bath linens. Our REI travel towels would have been great to have in the backpack on rainy days or on days when our wanderings brought us to the beach. We forgot ours at home, so we bought one in Chicago and then never used it. 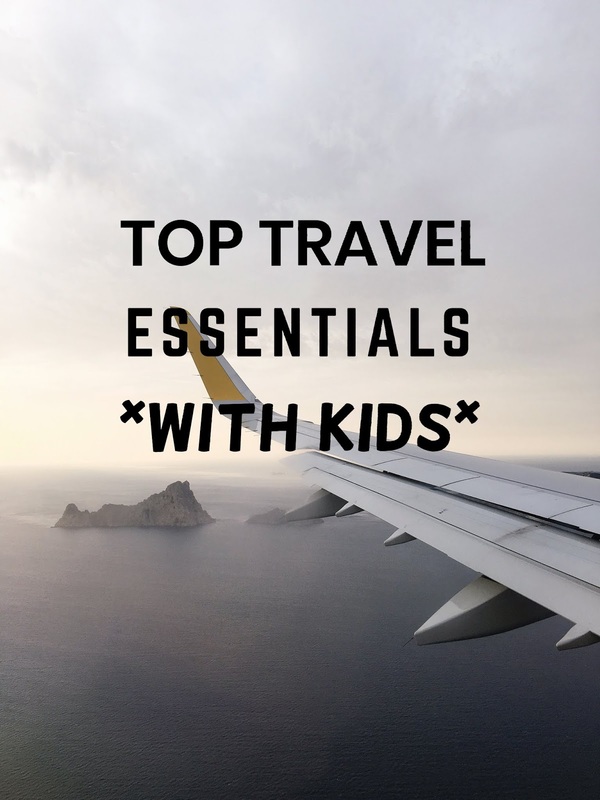 But if you might take a taxi or rent a car, save on the carseat rental fee and get a MiFold. It's small enough to carry around in your backpack when you go out exploring. Your chargers aren't going to work in European outlets. 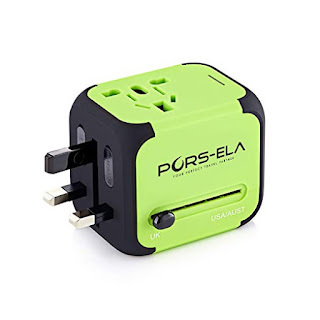 This adapter doubled as our charging block for phones, laptops and kindles, as it had two USB ports. If you have an iPhone with good battery life, you'll probably be fine, but our crappy old phones lose battery life within 8 hours when you're constantly on GoogleMaps and TripAdvisor. I can't tell you how many times this Anker portable battery saved our skin. Specifically for the 4-year-old child being toted around to historically significant that were not interesting to her. We had no space to bring toys, except one or two small dolls that she eventually grew bored of. 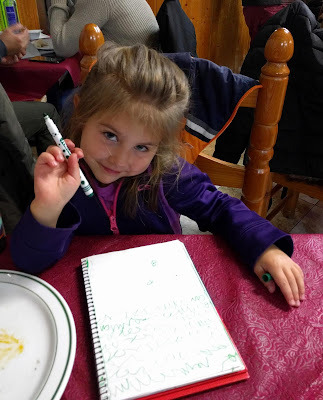 This 1,50 euro hardcover notebook, together with 2 euros in writing utensils, were her constant companions. 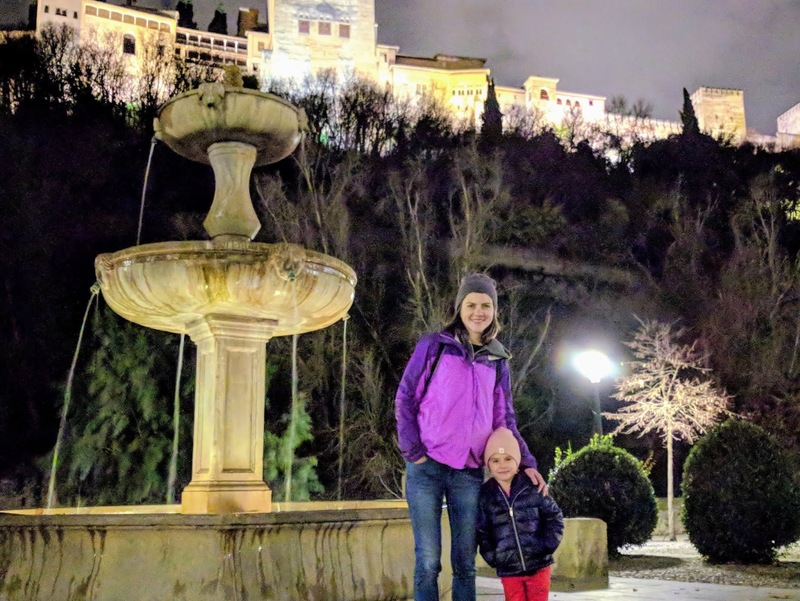 She was able to create, to play open-ended games quietly by herself on planes, trains, at busy restaurants, and on rainy or sick days when we were cooped up. 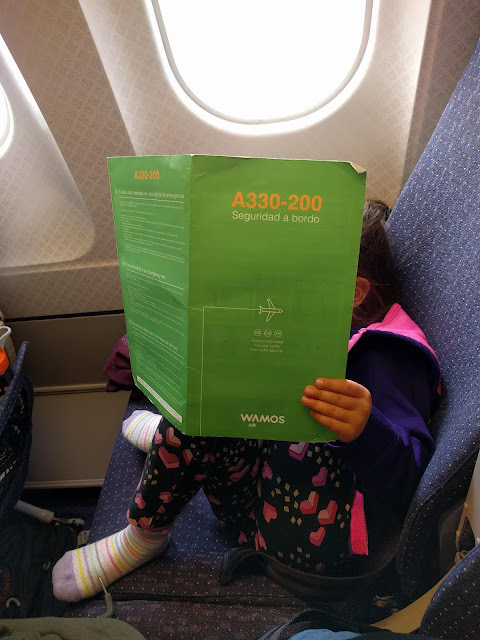 We called it her Travel Journal. I was so proud to see her happily scribbling away, asking me how to spell words or to play tic-tac-toe. It was all she needed to entertain herself for 2.5 months and we carried it absolutely everywhere with us. Every child is different, but some sort of open-ended creative toy is highly recommended. 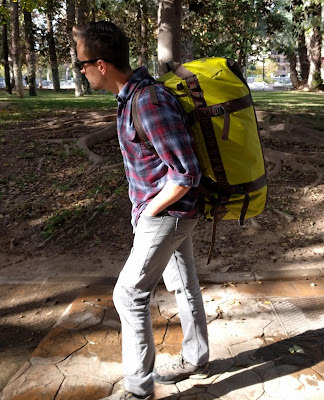 Any other vagabonding essentials I missed? 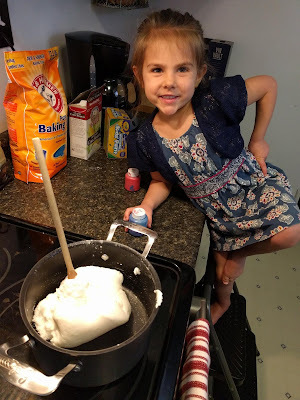 Avoiding wheat flour requires diligence, because wheat is in everything. 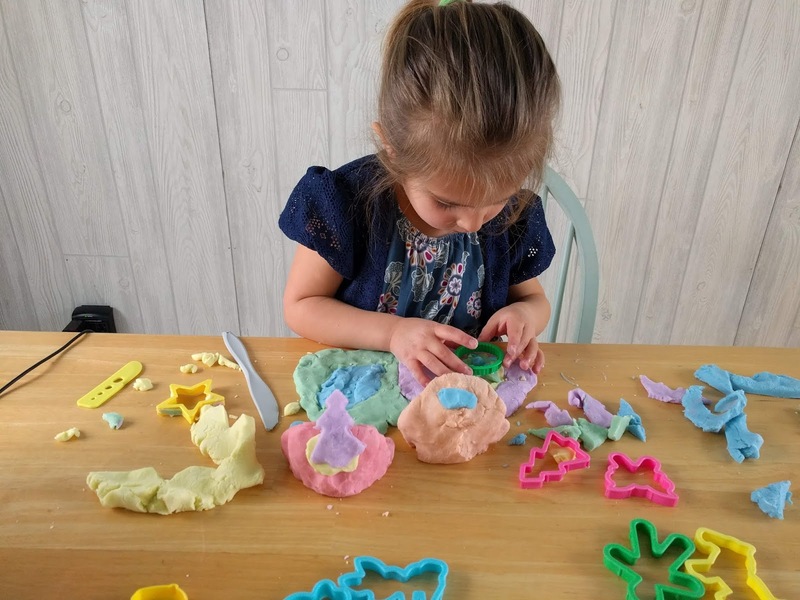 Not only can it cause problems when ingested but it can also be absorbed through the skin, which rules out Play-doh for people with severe gluten allergies. Combine the first three ingredients in a pot over medium heat and stir until it forms a ball. It can't get any simpler. It takes about 5 minutes of constant stirring. You can feel it thickening at the bottom, then all of a sudden it's hard to stir, then it clumps into one big ball and you're done. Divide into portions. Dab some paint (we used Crayola washable) on each (1/2 tsp makes a nice pastel color). 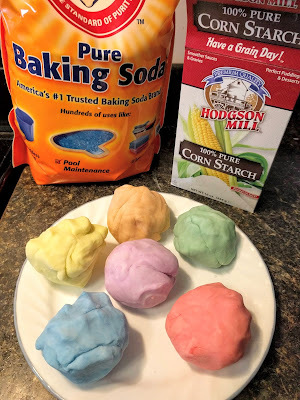 Fold the paint into the dough and knead to incorporate. (This was Babs' favorite part). Once the paint is incorporated and the dough is cooled, the paint won't come off on your hands. Store in airtight bags. If it dries, it'll form a crust on the outside. You can fold this back in and knead it until the dough is pliable again. But I find after a couple weeks, the dough is spent. It becomes either brittle and crumbly or moldy and stinky. In either case, chuck it and start again! 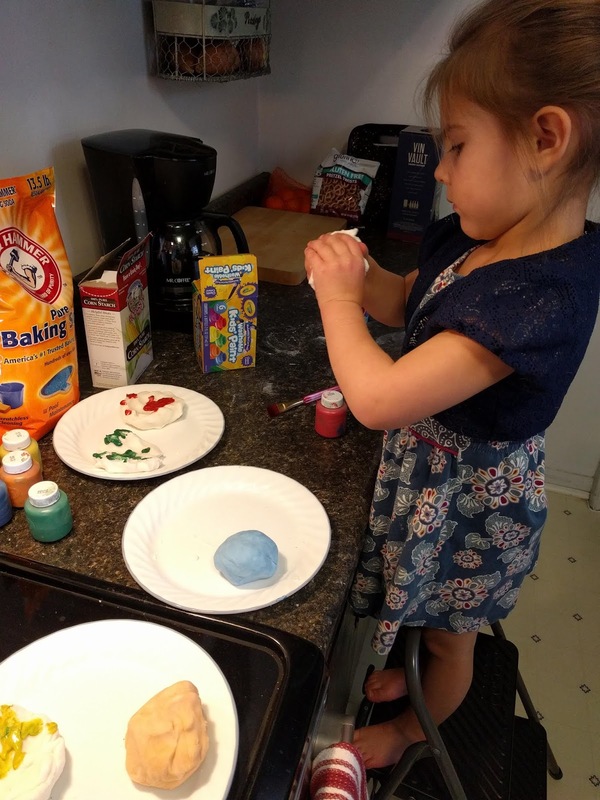 Making it is part of the fun! 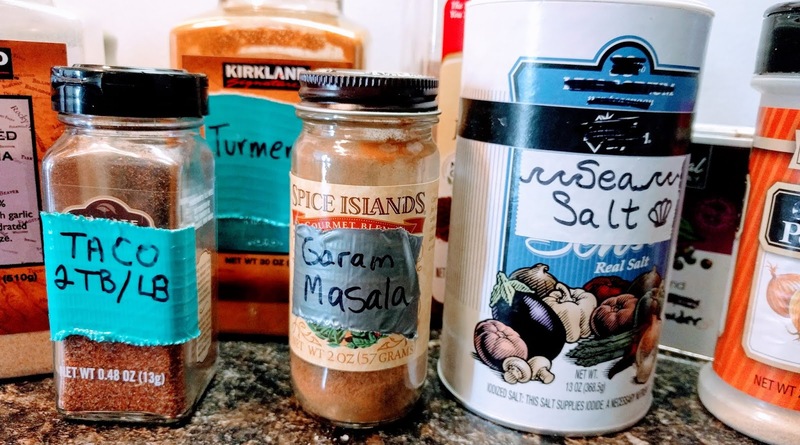 Buying pre-made spice mixes from your grocery store can be convenient for people who don't have a lot of spices already in their pantry. But the markup for that specific combination of spices is nasty. Not to mention they usually have sneaky ingredients added in (like my nemesis processed sugar or more salt than a person should consume). 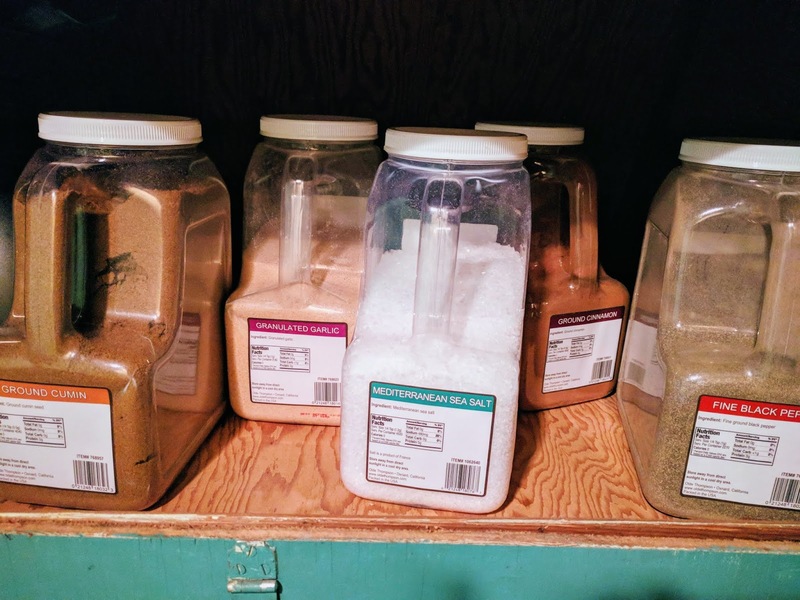 Save money and know exactly what you're putting on your food by blending your own mixes. It's EASY!! It's mild, for the babies in the family. Kick it up a notch by adding another 1-2 tsp of cumin, 1/2 tsp of red pepper flakes and another 1/2 tsp of pepper. The recipe makes about 5 TB of blend. I use 1-2 TB per pound of ground meat. This is an easy, mild Indian spice mix, typically found in curries and the like. Most Italian seasoning blends contain thyme, which I despise, but feel free to add in 1 tsp if that's your thing. The following blend from The Pioneer Woman is super easy. I don't normally have ground ginger or allspice so you know what? I just leave them out and it's still delicious. These are some of my favorites, but over at Wellness Mama you can find recipes for your own Curry Powder and tons more. Herbs and spices are paramount for delicious variety in your cooking. Jazz up boring vegetables in a million different ways! Side Note: I'm a big Costco fan, even more so since they added pantry items to their online store, and recently bought truly ridiculous-sized barrels of my most-used spices. I highly recommend it. Go in with a friend or two and split them! You don't want to bring your 5 oz. bottle of facewash when you're traveling. First of all, there's no space. Secondly, when flying, you don't want to check a bag if you don't have to. 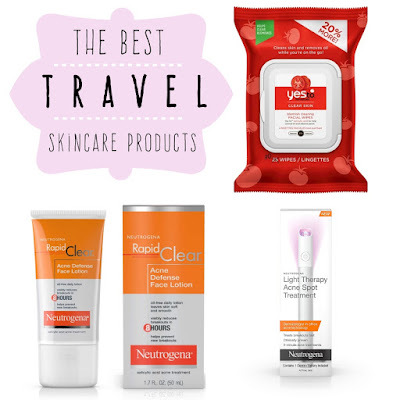 So how do you keep your skin clear for all those vacation photos? I label this as "Travel Skin Care Products" but I use these at home too, because it's easy and fast. I'm a mom, I don't have time for clay masks and cucumber eyes. Everyone's skin is different. Honestly, everyone's skin is different on different days. The monthly changes in hormone cycles and lifelong changes make it difficult to find one skincare routine that works. Real Talk: I have supremely oily skin. In the morning my face is so shiny you could see your reflection on my forehead. My acne was never really bad, but I always had at least one big zit on my face. And not the fairly benign surface-level whitehead, oh no. The deep, painful boil type that emerged from my face like a volcano. If your skin is similar, this may work for you too. These Yes facial wipes have 1% salicylic acid, a good chemical for combating acne. It also removes makeup pretty effectively. (I use a different wipe for mascara and save these wipes for my T-zone). They are perfect for travel (especially camping and van living) when access to water for face washing is spotty or inconvenient. After washing your face with your preferred method, if you live in a dry climate you'll want to moisturize. But what lotion can moisturize without adding oil, plus give you a boost in fighting acne? 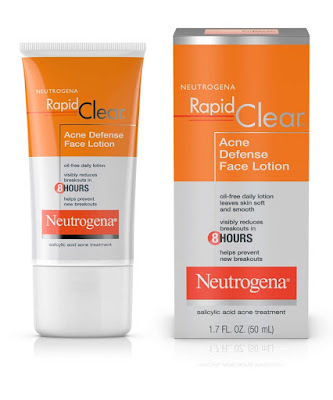 With 2% salicylic acid as the active ingredient and no oil to weigh down your skin. Plus it comes in a conveniently travel-sized 1.7 fluid ounce bottle. To skimp and make the small bottle last, only use it on your problem areas and use a different lotion (I like Gold Bond) for areas not prone to acne. Yeah I definitely brought it to Spain with me for 2 1/2 months. And I used it, too. It's small enough to fit in my cosmetic bag and is powered by one AAA battery. You have to catch pimples early for this to work, though. Once it develops a head it's too late for you and may god have mercy on your soul. As soon as you feel that tenderness under your skin, zap it with this bad boy. 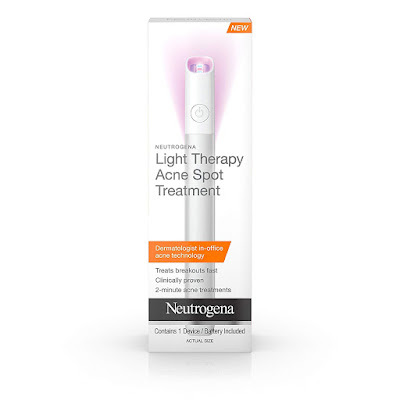 It blasts light under the skin to kill bacteria, stopping the zit before it blows up. It's important to wait for the entire 2-minute light cycle to finish. Use it on a clean, lotion-free skin for best results. There you go! 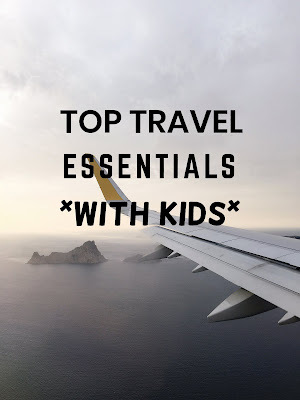 Small products that are effective, convenient and good for travel. Happy trails! 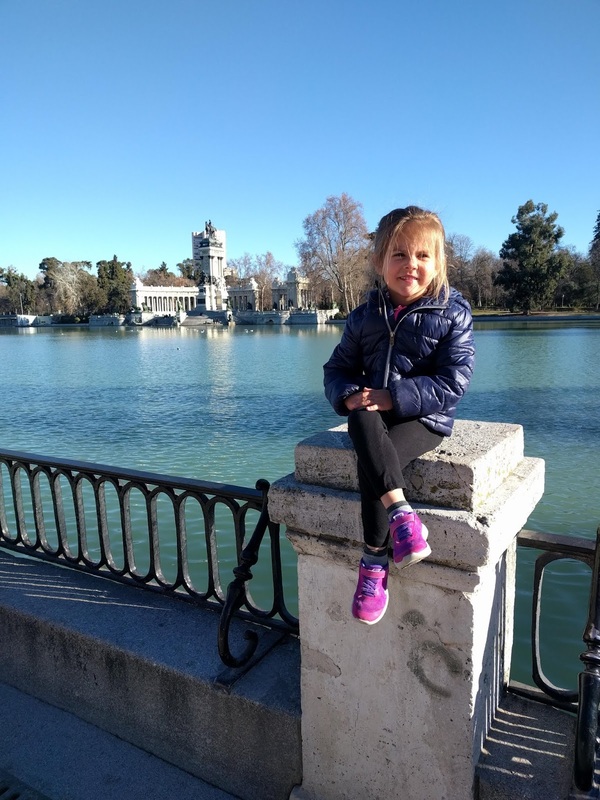 After a few days in Seville, we headed onward to Madrid, the last leg of our journey. I'd checked on train tickets from Seville to Madrid and saw the number 74. Assuming it meant 74 euros total for 3 travelers (since that's the way Alsa's website works), I thought it was a done deal. But nay, Renfe shows you prices per individual ticket rather than the total. So booking passage to Madrid became a little more difficult. Instead of a 4 hour, 200 euro/passenger train ride, we opted to spend half that for a 7 hour bus ride (via carrier Socibus). Mr. Go likes buses better anyway, something about a better scenic view than trains. Given my tendency toward motion sickness, I was not looking forward to it. We downloaded shows on our phones to keep Babs entertained, made sure we had puke bags handy and set off. ProTip: Much of the time, bus routes, especially between smaller destinations, are not listed online. Save grief and money by going to the bus station beforehand to scope out the destinations and timetables. I stocked up on some snacks prior, because I had no idea how many times the bus was going to stop. I'm glad I did. We had one 15-minute stop about halfway through the trip, at a roadside gas station. Babs felt sick for a little while, so I held her head over the plastic bag. Luckily no vomit, but she fell asleep with her forehead sagging against my palm. She'd been snoozing on my lap for about 10 minutes when our bus was stopped and searched by the Guardia Civil. I knew I was completely innocent, but my heart started thumping anyway when the golden retriever came on board to sniff everyone. Two passengers had to deboard for a search. After a quick search of the luggage under the bus, we were released. We stopped in Madrid, just a few kilometers from our airport destination, so the bus could top off on some oil, I think. A Spanish girl translated for us, but we were not convinced she knew what she was talking about. We loitered in the bus station for 20 minutes until the bus returned and brought us to the airport, where we called the SHS Hotel Aeropuerto shuttle. We'd been using Airbnb this whole time. This was our first actual hotel since the States. Aside from the outrageous restaurant prices, it was lovely. Crisp sheets, an unending flow of hot water and good wifi. Madrid has great public transportation, and between the hotel shuttle, the train and the green bus (with a stop directly outside our hotel), we were able to make the 7km jaunt from our hotel to city center for the next two days. We didn't do a whole lot of exploring in Madrid. We were Over It, and cities aren't our favorite anyway. Madrid didn't even seem to have an old town proper. The Plaza Mayor and Puerta del Sol that are touted as the 'center' of the city were simply large plazas surrounded by shops. We didn't see any of the narrow cobblestone lanes that marked our other Old Towns. Madrid felt like New York City to me. As we were making our way to the Puerta del Sol to check it out, I looked down the major pedestrian streets to find a sea of people. It made me shudder. We didn't spend much time there. Instead we walked through El Retiro, one of the city's big parks. Mr. Go wanted to take a boat on the lake, but when we reached it we realized the lake was no more than a large pool. So we walked around it, then headed off for sushi. 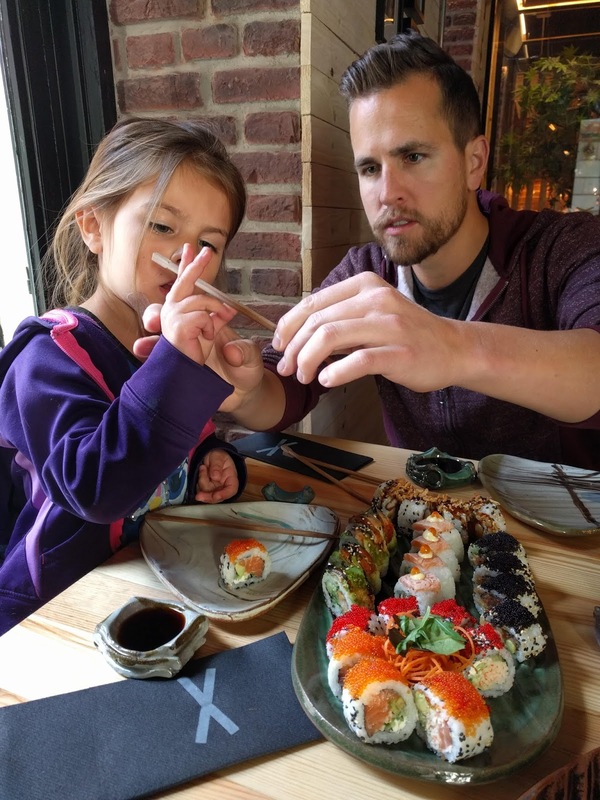 Sibuya Urban Sushi Bar was phenomenal. As a large city with something for everyone, we found plenty of gluten-free options. Celioso was an exclusive gluten-free bakery with cupcakes, cakes, breads and cookies. Not all-star caliber, but we were tickled to sit down for coffee and cake just like Spaniards. The next day, we managed to slip in just ahead of the lunch rush at the #1 rated restaurant in Madrid Los Montes de Galicia. With entrees starting at 20 euros, it was one of the pricier meals, but still cheaper than some mediocre meals in Denver, plus it was absolutely delicious. They served us two free tapas plates, plus a free dessert for Babs, who, as per usual, charmed all the wait staff. 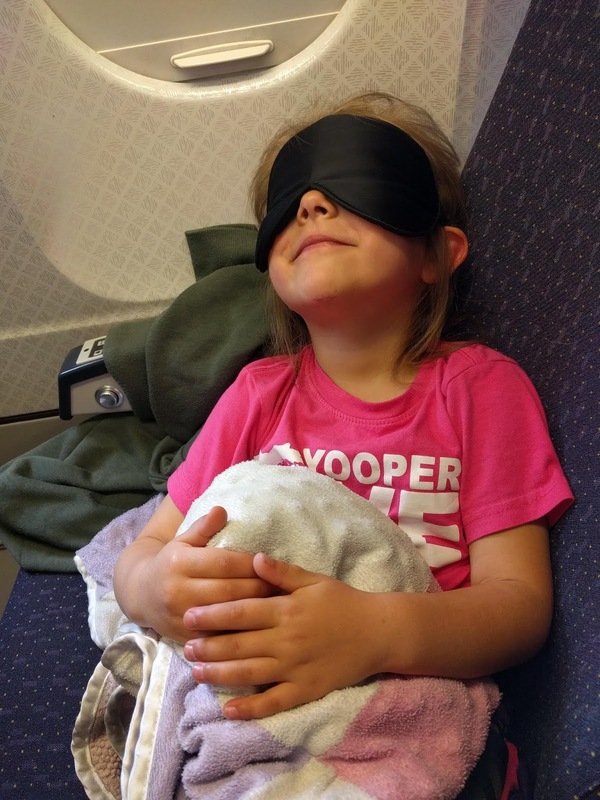 We were so clever to book our flight to Spain in the evening, so our bodies could sleep on the long 9-hour leg. For some reason we neglected to do the same on the return journey. Our flight back to the states left at 8am (via Wow & Norwegian Air) which meant taking the airport shuttle at 5am. With the sunlight streaming in through the plane windows, it was nearly impossible for Babs to snooze. We cajoled her into a 20-minute nap but for the remaining 8 hours and 40 minutes, she was wide awake. We watched a movie, we listened to a book, we had snacks out of my backpack, she colored a little, took seventeen trips to the bathroom. She was a wreck by the end, tired but wired from a day of inactivity. We landed in Chicago at 3pm, (10pm Spanish time). Then we proceeded to stand in the customs line for an hour. Due to the government shutdown, there were very few staff working and it was chaos. Finally we got our bag, got our rental car and drove an hour and a half to a Motel 6 in Saukville, WI. At a 24-hour Subway we realized we could have basically an omelet by piling veggies on their egg patties. We puttered around at 24-hour Walmarts and Meijer (Babs needed snowboots) until it was time to return the car to the Green Bay airport and meet my in-laws, who would deliver us home. The feeling of walking into my house was beyond lovely. I thought my house was small before, but after living in European apartments for months, our place seemed enormous. It was clean and spacious and smelled like home. Not even the 2 feet of icy snow could spoil my happiness at being home. Re-integrating into U.S. society was easy. I appreciate the dependability so much more. And the ease of everything! To be able to call or go somewhere and explain what I need and to understand instructions. I feel like I'm still processing everything. The ways in which we stretched the limits of our capabilities will have lasting effects in every area of our lives. The experiences and lessons we learned will continue to affect us as we reintegrate ourselves into our lives, as does any stint of extended travel. 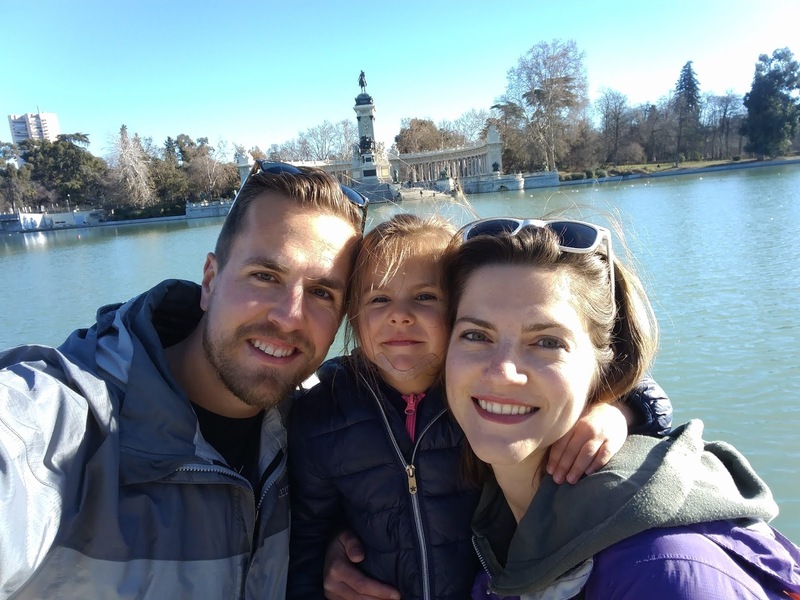 We've already had a few conversations about what adventures 2019 will bring us, but for right now, we are thoroughly enjoying home. A family on an adventure to need less and live more.